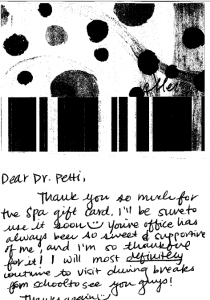 Thank you so much for the Spa Gift Card. I’ll be sure to use it soon :). You’re office has always been so sweet & supportive of me, and I’m so thankful for it. I will most definitely continue to visit during breaks from school to see you guys!